Professor Robert Cialdini identified six universal principles of influence: Reciprocity, Scarcity, Authority, Consistency, Consensus and Liking. This time, we're looking at #3: Authority. We want to follow the advice of a legitimate authority. In Malcolm Gladwell's terminology, a maven. An expert provides a fast track to decisions requiring specialized knowledge. Our clients need to see us a credible and trustworthy. 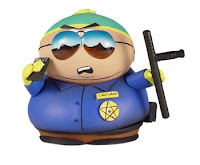 There's a difference between being an authority (the meaning here) and in a position of authority (like police officer Cartman). Experts require credibility and trustworthiness. That's not enough. We also need to bring our expertise to the consciousness of our clients before making recommendations. But how? Tooting our own horn is not effective. You can have someone else endorse you (see How Would You Sell Soap?). You can describe how you solved a similar problem for someone else. You can briefly mention your background and experience near the beginning of the meeting. You can mention your online presence, if you have one. The mentioning the small weakness focuses the client on the strength, which receives a disproportionate level of attention and credibility. Contrast Buffett with Bill Ford who said a couple of years ago: I feel good about our plan, but we have a long way to go.